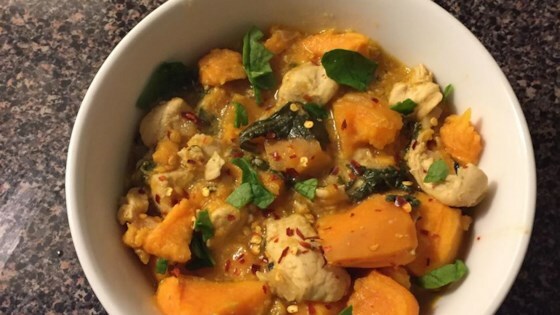 "I made this recipe up when I started eating paleo. I have now found it to be a staple in our home!" Heat olive oil in a saucepan over medium-high heat. Saute onion and garlic in hot oil until softened, about 5 minutes. Stir chicken, sweet potatoes, spinach, crushed red pepper, paprika, and sea salt with the onion and garlic in the saucepan. Pour as much chicken broth into the saucepan to make the mixture as soup-like or stew-like as you'd like it. Bring the broth to a boil, reduce heat to medium-low, and simmer until the chicken is no longer pink in the middle and the sweet potatoes are tender, about 30 minutes. According to my "Paleo Cookbook" a potato of ANY kind is a non-paleo food. This had a ton of flavor my whole family loved! We are trying to incorporate paleo into our lives as much as possible, even my 7 year old loved this! This was a hit. The flavor was there. I did double everything and added plenty of broth and adjusted the seasoning to taste. This is a keeper. Fantastic recipe! I added a lot more chicken broth than the recipe stated, enough to cover the chicken and potatoes. Easy to make and we will definitely make it again.